What kind of animals do you deal with? If I donate to WASART, how much of my money actually goes toward helping animals? What animals do you have available for adoption? Will you come and speak at my event/organization/meeting/church? I found injured wildlife. Who do I call? I found a neglected pet/livestock. When can you come and get it? When do I set my animals loose during a disaster? WASART (Washington State Animal Response Team) is a 501(c)(3) nonprofit all-volunteer all-donation supported organization that helps companion animals and livestock out of immediate crisis and dangerous situations. 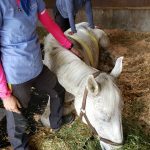 For example, if your horse falls into a well, your dog falls over a cliff, your cow got stuck in a barn wall, or your community needs help sheltering animals for short term issues such as threat of fire, WASART is trained to help out in these situations. Though WASART does not self-deploy, the team may be called out by an owner or an agency such as the fire department or sheriff’s office. WASART is trained handling companion animals such as dogs, cats, rabbits, hamsters, and other small mammals. We also deal with chickens, pigs, cattle, horses, llamas, alpacas, goats, and sheep as well as other livestock. We are not trained to handle wildlife or exotics such as snakes, birds, deer, tigers, meerkats (we’re sorry about that, too), and elephants. No, WASART is an all-volunteer-run nonprofit. Sometimes WASART is called out by government agencies and our responders are credentialed as emergency workers, but WASART is not a government agency. WASART does not charge for services. Much of the equipment and training is expensive however, and donations are always gratefully accepted so that we may help others in the future. Essentially all of it. No WASART member is paid. The money we raise is used to buy rescue equipment and training materials, pay the answering service that handles our incoming calls for assistance, buy fuel and pay for licenses and insurance for the WASART vehicles, and similar expenses. Our members buy their own personal rescue gear. We pay a small amount to a grant writer to help us raise additional funds, but it is a very small percentage of our overall expenses (>0.2%), and is decreasing as our membership becomes more skilled in fundraising. As emergency workers, WASART is not a foster-adopt rescue organization. WASART gets an animal out of a tight spot and returns it to the owner or hands it over to the appropriate agency such as animal control. As a 501(c)(3) nonprofit, WASART is funded through memberships, training fees, donations and grants. Without these, we would not be able to help rescue animals. WASART may respond to the call of a companion animal owner or livestock owner whose animal is in distress or danger. We may also respond to the request of an agency such as the sheriff’s office or fire department. We are credentialed emergency workers who work within the ICS (Incident Command System) structure. We do not self-deploy. Yes! Probably. Part of our mission is education and helping the community be ready for a disaster. We make as many speaking engagements and events as we can, but since we are an all-volunteer organization, we are sometimes limited in our availability for outreach volunteers. Call your local Fish & Wildlife office. We love wildlife but are not trained to handle it safely. If we are called by animal control, the sheriff’s department, county auditor’s office, or another agency we can help retrieve and shelter companion animals or livestock. Unless you are the owner, we’d ask you to call your local authorities since we absolutely do not self-deploy or respond to the call of concerned citizens. Contacting the authorities in the case of neglected or abused animals will help them build a case against the perpetrator. Make a kit for yourself, your family, and each of your pets. Start today. No, seriously. Today. Add a couple items a week if you have to. Make it a competition in your neighborhood if you must. In times of evacuation, you may have fifteen minutes to grab what you need and leave. The internet will likely be down, cell towers may be overloaded or locked for emergency personnel. Keep cash on hand because stores and hotels may not be accepting credit cards. Keep your car at least half full of gas at all times. Expect to be gone, or without power or resources for at least three days. WASART recommends an airline grade kennel large enough for the pet to be able to turn around in. Designate an out-of-the-area contact in case family members are separated. There is a comprehensive list of suggested supplies as well as other great information at FEMA. We would also add to bring items of entertainment such as toys for your pets. It will be stressful for them as well, and a touch of home can help relieve anxiety. With livestock, have a plan to load up your livestock. Practice it so you can get as much of your herd within fifteen minutes. If your herd is too large to transport and you live in a flood-prone area, build an earthen berm high enough to provide the animals high ground to which they can retreat. Domesticated animals are not capable of helping themselves when set loose. They cannot make decisions necessary for survival, and are in more danger being set loose than if you take them with you. In the case of livestock you must leave behind, use a cattle marker or spray paint to write a contact phone number on the side of the animal.